While Americans were busy with their 4th of July barbecues, fireworks and fun, our fiends across the pond were busy with something special of their own. No, it wasn't the royal birth. What it was was the relaunch by IndieBooks of the first three Worrals books originally written by Captain W. E. Johns during WWII at the RAF Museum in London. 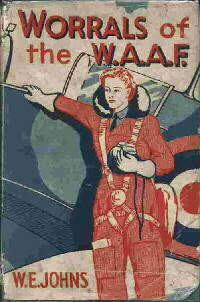 Flight Officer Joan Worralson was first introduced to British girls in September 1941 with the publication of Worrals of the WAAF (reviewed here). This was followed by 10 more novels and one book of short stories detailing the flying adventures of Worrals and her best friend Frecks in the Women's Auxiliary Air Force. Though only supposed to ferry planes between their makers, aerodromes and the front, Worrals and Frecks manage to get themselves involved in all kinds of wartime situations other than ferrying. Worrals was a much needed strong, competent role model for girls during those difficult and dangerous days of the war. Fearless, feisty, witty, and plucky, Worrals was everything a girl could want in a protagonist even though Frecks probably embodied the average girl more - avoiding danger, enjoying chocolate and reading film star magazines were more her thing. It has been a long while since the Worrals books were published and now they are sometimes difficult and/or expensive to find. I know that from experience. When I was working on my dissertation, it took me quite a long time to track them down and I was never able to find all 11 Worrals books. But now with the relaunch of Worrals in the WAAF, followed by Worrals Carries On and Worrals Flies Again and the rest of the Worrals oeuvre, today's reader can enjoy reading about Joan Worralson's exploits once again. The only two differences - we are not in the midst of a world war and there are new updated illustrations. The original books had lovely realistic illustrations. The new illustrations were done by Matt Kindt, a name that might already be familiar to any graphic novel fans. Captain J. E. Johns, who also wrote the Biggles novels (reviewed here) stills has lots of old and new fans, so these new editions of Worrals should be welcome additions to many personal libraries. If you are unfamiliar with Worrals, you can find lots of information at Roger Harris' dedicated Worrals website HERE. Lovely, lovely covers you have here. I'm a certified sucker for vintage designs. I haven't met Worralson until you mentioned her, and since her adventures are in a series, for which I have a weakness, I will definitely check her out. By the way, have you read Code Name Verity? It's on my wishlist right now. Hi Nancy. This is a fun series, a little corny in the way that some WWII things are but certainly worht reading. Yes, I have read Code Name Verity. It is one of my favorite books - a real contrast to Worrals, for sure. I hope you have a chance to read CNV real soon, it is such a wonderful book. This looks like a great series of books. How wonderful that they are available for people to enjoy again. :) They sound good! How interesting that you used them in your dissertation. Thanks for sharing. I look forward to checking these out. Love the covers and the subject matter. I'm glad they are relaunching this series.